My favorite part of fall and winter is eating foods that warm you from your core. 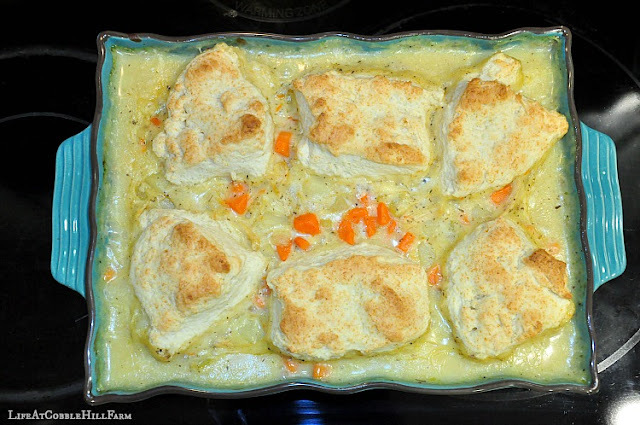 This is a homey casserole made with fresh veggies, leftover chicken and topped with cream biscuits. The ultimate comfort food! It's an easy dish that's fairly quick to pull together making it ideal for weeknight or weekend evenings. Melt the butter in a large dutch oven over medium heat. Add the carrots, celery, onion, and a pinch of salt. Cook until softened, about 7 minutes. Stir in the garlic and thyme and cook about 15 seconds. Stir in the flour. Slowly whisk in the broth, scraping up any browned bits. Add the boullion, cream and bay leaves. Simmer until the mixture is thickened, about 10 minutes. Season the sauce with salt and pepper to taste. Stir in the chicken and continue to simmer until chicken is cooked through, about 10 minutes. 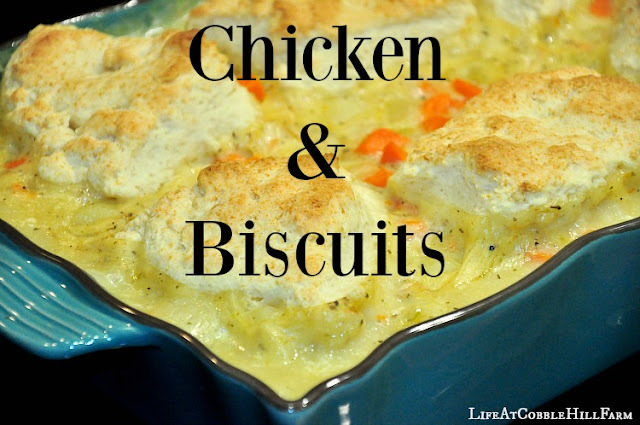 While chicken is cooking, make the biscuits. Whisk the flour, sugar, baking powder and salt together in a large bowl. Stir in the cream with a wooden spoon until dough forms, about 30 seconds. Turn dough out onto lightly floured counter and gather into a ball. Knead until smooth, about 30 seconds. Pat the dough into a rectangle, about 3/4" thick. Cut into 6 wedges, using a knife. Discard the bay leaves, from the chicken mixture, and pour into a 13x9" baking dish. Top with the biscuits. Bake until the topping is golden brown and the filling is bubbly, about 20 minutes. Let cool 5 to 10 minutes before serving.